Manifesto review (ACMI Melbourne then AGNSW Sydney) | Daily Review: Film, stage and music reviews, interviews and more. “Nothing is original, so you can steal from anywhere, okay?” Cate Blanchett, a teacher, tells her class in the bastardised words of Jim Jarmusch. She has that tranquility we associate with the best of teachers, hair slightly dishevelled but not too much, clothes slightly baggy but not too much, as she tells her children to consume everything and then plagiarise it back. The words at once jar — of course this is not the advice a teacher passes onto her students — and fit perfectly — as valid a lesson as any other. This tension is constantly present in Julian Rosefeldt’s Manifesto at ACMI. A thirteen-channel video work, Blanchett stares down at us again and again speaking the words of these titular manifestos collected by Rosefeldt, bringing together the words of dozens of artists from over 100 years of thinking. Walking into the space, the screens at first seem to invite solo viewing, time best spent with all of Blanchett the widower, then Blanchett the stock-broker, and then and then and then. But as you enter deeper into the room, the arrangement of the screens shifts and Manifesto increasingly leans into the sound-bleed and an unspoken stand-off between characters. Stand in just the right spot you can hear one speech perfectly; off this place and you are faced with a dizzying cacophony. But always, Rosefelt gives us moments of quiet away from the manifestos as the camera pans across television stage lights, or quietly observes the table being set for dinner. Men in suits and women in high heels stand lakeside, picking glasses of champagne off silver platters, while on the adjacent screen a homeless man truds against the cold ground shadowed by abandoned buildings. Female dancers, lithe and tall in skintight costumes of alien creatures, rehearse in a theatre of contemporary opulence, while a woman manipulates a crane picking up garbage. A conservative American family prays, ignoring the scientist walking through halls of industry on the screen opposite. Words feel at home as a woman eulogises “there is no beginning”, or a director tells her performers “life is an artwork and the artwork is life”; they feel foreign as the nightly prayer becomes not about God, but about art. Texts are stripped of meaning, and then find new and unexpected resonances. Or they don’t, and they sit in the air strangely detached. 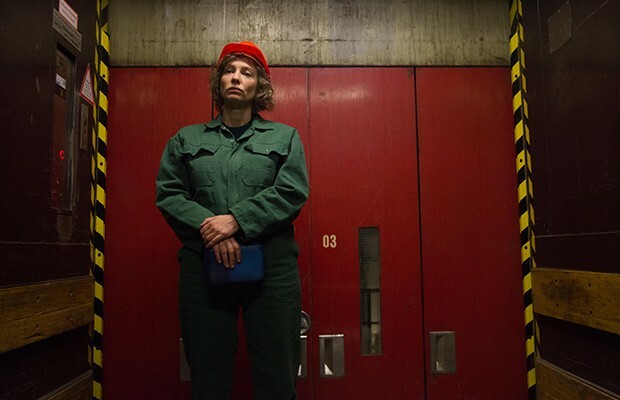 While Rosefeldt’s work explores these specific texts and philosophies, Manifesto also becomes about Blanchett, both her power as a star and about her nimbleness as a performer. Between screens her face seems to remodel, as muscles relax and tense to build each new character, her performance traversing class, country and gender. Within each character, too, there are major shifts: characters fully inhabit Rosefeldt’s created worlds, before they stare down the camera at us, manifesto turned from conversation to drone. She is a master performer, but by placing her face again and again in front of us Rosefeldt refuses the shutting out of our knowledge of her as The Famous Cate Blanchett. All art is fake. At ACMI, Manifesto shows with three of Rosefledt’s earlier works, all of which allow you to sit and consume, gently introducing the viewer into his aesthetic and interests. But it’s Manifesto that quite rightly sits as the hero of this exhibition: a mess of words, worlds, contradictions, and synchronicity. Giving yourself over to it, it can do nothing less than overwhelm. Manifesto is at ACMI Melbourne until March 13 and then is at the Art Gallery of NSW in Sydney from May 28 until November 13. Utterly beautiful and compelling in its austerity, its unique message, its wonderful complexity, its profound simplicity. Thank you. Thank you. Thank you. As one artist to the many who made this work I applaud you! Sounds like YOU have an issue there.